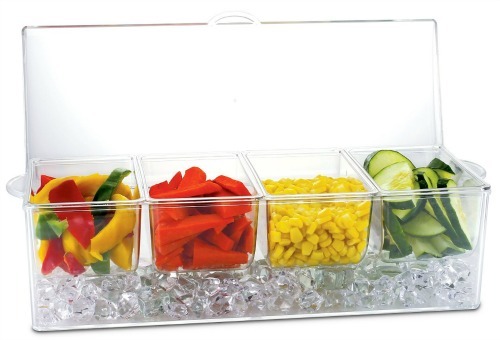 This condiment tray is a must if you like to have fresh (and cold) veggies out for a party, or even just for snacking. My kids love to eat veggies, but they won't eat them if they are room temperature. With this tray I can have pre-cut veggies in my refrigerator ready to pull out for them to snack on while I make dinner. All I have to do is add ice to the bottom and they stay cold all the way through our meal even. Each compartment holds about 2.5 cups of veggies, but it really depends on how you cut them. I tried to cut my carrots and celery so they would lay flat in the compartment and it would hold more. I like that you can store the container in the refrigerator until you are ready to use it also because it has a nice hinged lid. The compartments are each individual so you can just take one out if you need to refill them. I can see myself using this a lot for picnics as well as dinners and parties at home. It's a very nice looking piece so I'm not embarrassed about setting it out with my dinner foods. Love the ice space underneath!! I hate how everything gets soggy and gross during hot outdoor bbqs!! I love that it is clear and basic so would match with any decor or party theme!! This would be great to get for my parents, they are always having bbq's and diner parties....I think my mother would really love the convenience!